Somewhat confusingly, the words “Nebraska Amish” often refer to the “white-topper” group of Pennsylvania and Ohio which bears that name–legacy of an associated bishop and early church members from the Cornhusker State. Less is heard about the small population of Amish who actually live in Nebraska. Amish America contributor Tom Geist today shares his visits to the handful of communities in the state. The area of Verdigre in Knox County is home to two separate Amish communities. One of them is a Swartzentruber Amish group, which Tom says has about a dozen families. This sign is from a small home business in the community operated by the Zook family (comments that follow are Tom’s). The semi muddy road leading from the main road to the Zooks’ place. Unlike some places I have been in Indiana and Ohio, the back roads for the Nebraska Amish are gravel and sometimes just plain dirt. The best time to visit is after a little rain, where the moisture holds the clouds of dust down, but not after a huge rain, where you might not make it out of the mud. A view of a couple of outbuildings. I was told by the man that some of the others were busy moving manure out to the fields, so I parked out of harm’s (smelly) way. A side view of what appears to be two houses. You can’t see it in this picture but the two houses are joined with a connecting area. A mini dry good store (not listed on the sign by the main road) was being housed a narrow set of stairs. The woman that took me to it said she had hopes of someday having a bigger, ground level place to work out of, but it all takes time. I think this depicts some lumber pieces that they make, though I didn’t talk to them about it. My view as I leave the Zooks’ place. A member of the community even took out an ad in The Budget to encourage others to give them a try. Communicating via The Budget and other Amish correspondence newspapers is a long-established technique for attracting others to fledgling settlements. For one reason or another, sometimes Amish settlements simply do not grow. It seems like it would be discouraging to invest so much time, money and energy in a new community only to have it fail to develop. But it has happened many times throughout Amish history in North America. We’ve only got one photo from the Orchard Amish community, courtesy of Tom’s dashboard camera. Is it just me or are those tires different sizes? Either way, they look just right for gripping the road. He adds that one family operates a small bulk food store. Both Orchard and the village of Ewing are named in the community listing in JAPAS. In addition to these three groups, there is a community at Pawnee City in Pawnee County (founded 2007). In 2012 there were reportedly around 30 families in the Pawnee settlement. Tom was also told that there are Amish near the village of Center (also in Knox County, about 10 miles from Verdigre). As of 2013, all Nebraska settlements were just one church district in size. I have been to Pawnee City for there Amish School auction. We are planning to go again this year if possible. New York State also has a small Nebraska Amish settlement in the Steuben County town of Pulteney. There’s an Andrew Zook in Ethridge Tennessee who does beautiful woodwork; wonder if he’s related to these Zooks? I believe there are also some Mennonites in the Auburn, Ne. area. I think they came to the area within the last few years. Thanks Tom and Erik for the shots and story. I would love to see in person the place you pictured with the buggy beside the picket fence and white frame house. Tom (or anyone else with some experience in this), I would be interested in knowing more about the dash cam. I’m not ready to give up the Nikon for shots that I can use it on, but there are tons and tons of shots that I never can get because I’m driving. What kind do you have/recommend, and what are the features and limitations? First of all, the pictures you take with a camera will always look better, not just because of the camera but the operator! The dash cam takes videos that I later pull select photos from. I am not a technical person so I can’t make a reliable recommendation. If you have an interest, send me a email I can show you one of the videos I’ve taken with the cam. Tom, got caught up in another branch of this thread earlier, and totally forgot to say thanks for the info. Sorry. And thanks! I’d like to ask about the dry goods store. I wonder if this place is strictly for the consumption of the Amish, I suppose they obviously do allow considerate English visitors. When I read that I recalled the less than welcoming reception I received years ago at what was a store attached, without advertisement, to someone’s house, seemingly by their intent for Amish/Mennonite use in Ontario. I sort of hope those people, the Ontario Old Order folk I met, went out of business, even if your intended clientele is your neighbours and fellow church members, the better business model would be to embrace everyone. I’m not bitter, it just stands out and I’ve learned a fair bit about costumer service since then. All of the Amish stores I have run into in several states have allowed English to buy from them as well. Of course, if a Amish community had such a store that they only let Amish buy from then we probably would not hear about them to begin with. I did run into a small bulk food store that was run out of a Amish Bishops basement in Kansas. He mainly had some staple items that the local Amish would regularily buy. The “store” very informal, not looking like a store at all. 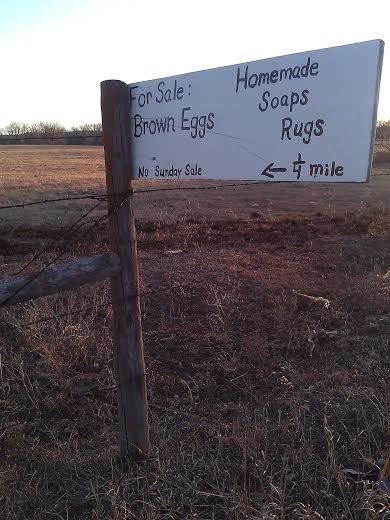 I think some Amish just don’t think about posting business signs until they need to. Some seem to feel like everyone already knows where they are at when it’s really just the local Amish that know. Other reasons they don’t post a sign? One is the cost. In some areas there are regulations as to who can post a sign, the dimensions of it, the material that needs to be used and so forth. So it’s not as simple as just going out and posting a sign to a post, sometimes a master sign erector has to come into play, due to laws. Finally, I have found that marketing is not a strong suit for some Amish and English alike. I have business cards from a couple of Amish business’s that have either no address listed or phone number. The smarter ones (IMHO) will posts a little map on the back of their business card as well as pertinent info on the front. 1. To what degree are the Amish (as a community) dependent upon revenue streams from outside? 3. When I’m driving down the road and see the sign for an Amish cottage business, how can I tell if it’s intended just for the Amish community or for all? I would like to address your three points based on my experience visiting conservative Amish settlements in New York State. 2. Is there a *growing* dependence upon outside revenue (esp. as more Amish are no longer staying on the farms), and how does that dovetail with their strong belief to avoid being connected with the world? In my part of New York State farmland is fairly inexpensive and many Amish are moving in to take over abandoned farms. Many Amish that I know don’t want to be farmers and choose to make and/or service items to earn a living. A cabinet maker is building a small tear drop trailer for me; when I asked him if he would be interested in the work, he said, “yes, if it would put food on the table.” Dealing with outsiders is not the same as being connected to the world. If you have money in your pockets and an interest in the product produced, pull in, say isn’t it a beautiful day and start a conversation. Many shops do not have signs out front, but I have learned of their location and I enter, say hi and buy the product they have for sale. After 20 years of visiting the Amish I have learned that if I am respectful and friendly and say “I will take one of those and two of these” then pull out some cash and say I’ll see you next time. It works. Thanks so much, Tom. I, too, try to support the cottage businesses as I travel in the communities — seems only fair to give some benefit to those giving to me (even if just a smile, a visit, and an occasional appropriate picture). As to starving without the “English customers”, I can accept that but wouldn’t have guessed the interdependency had grown to that point. It’s always good to hear what’s happening in Verdigre, Center (the county seat), and other places in Knox County! Thanks. I had no idea that Amish people now lived there. I hope that they are enjoying the countryside as much as our family did when we lived there 1956-1963. I attended high school in Center 1962-63, then after the school closed went to school in Verdigre for the first half of the 63-64 school year. (There had been only about 7-8 students per grade in the Center high school.) I have a blog article with a few photos about the last time I visited the area, in 1995, at the start of the first of many bicycle tours I’ve done since then. In following some of the links in the article I figured out where the “pioneer” couple, the Petersheims, lived. It’s not a part of the county I was familiar with, but from the satellite view on Google maps it looks like a familiar type of terrain. I wish I could figure out where the Amish near Center are living. We lived almost straight south of Center at Bazile Mills. This past summer (2018) a bad hail storm went through Creighton and damaged MANY roofs. This is when I got to know Andy and his horse Sailor. When Andy, and usually 1 or 2 of his 8 (?) children came to work on the roof he’d unhitch Sailor and tie him to our pickup box trailer. Since that trailer is full of weeds,dirt, grass, etc it was very easy to put hay and oats on top for Sailor. Such a friendly man! Ok, now to the real reason for my reply. His boy said that he lives 4 miles north of Creighton and I believe 1 mile east. There were a few other things that I found out. He moved here from Ohio. The thing that kinda surprised me was that they do not have an actual church. (as in a building) Church is held in a family home that rotates. Some weeks it can take an hour or more to get to church. I knew there were Amish in Verdigre but I didn’t know about Orchard and was surprised when I found out Andy is from Creighton. Point of interest regarding Amish business: I’m not sure which Verdigre settlement it is but, one of them produces and sells products at the Bloomfield grocery store (Gragerts). I’ve seen jams, jellies, noodles, pickled beets, pickled eggs, and apple butter. I remember that they had a hard time because when they started, they were doing this in a home kitchen. Then the government stepped in. Based on my uncles experience with his butcher shop, USDA inspectors around here are VERY hard to please. But, in the end, these Amish women are putting out a very delicious product and supporting their local communities. I can think of a few Amish businesses in our community (Holmes Co., Ohio) that are not open to the public, like the lady who makes men’s Sun. suits to measure, but those are “word of mouth” businesses who do not advertise. If it’s got a sign out, it’s open to anyone. There’s quite a variety of Amish owned stores & businesses in this area. Sorry if this is a repeat of sorts…. but to make your trip to this area more worth while I would take an extra hour to drive North to Tripp South Dakota to meet the Amish there. Now, I understand that MANY Amish go to Canistota, SD for treatments. These treatments can last several days. (Ortman Chiropractic Clinic) A number of Amish I have met tell me if I want to meet Amish in SD that is the place to go. Not real sure how that would go, but I might try it sometime. My wife and I drive for the Amish in our community. Presently she is in Nebraska with a group from our community in mid-central Wisconsin. Our neighbors are Amish and there are several communities in our area. We frequently shop for dry goods in local Amish stores. When we had a disastrous hail storm years ago, it was the Amish that came to our rescue, re-roofing our house in a day as a school project. There is one family that runs a dent and bent store that is always busy, and there are always cars in their parking spot. The tradesmen are always ready to employ their skills gainfully. I have been invited to observe and then participated in the grain harvest. To see the old machines in use, and then be invited to dinner because I was part of the work crew was an honor I cherish. We have attended weddings, and buried their dead. Andwhen of their English friends passes on, you can bet they turn out for the viewing. When my wife went to the hospital to deliver our son 24 years ago, I dropped the boys off at the Detweiler’s and headed out to the hospital. My wife was in the hospital an extra day. When I came home I found 2 buggies in the driveway, and inside there were Amish women cleaning house, washing windows and generally making sure my wife didn’t have to worry about anything but the baby. That’s the kind of neighbors the Amish can be. Last summer we traveled with a couple by train to Grand Junction Colorado, and then spent 10 days sight seeing. We drove, stayed in motels, and toured the Grand Canyon, Mt. Zion National Park and more. Sam makes canvas tops for boats and pontoons. For an Amish gentleman he sure has a lot of boats in his pasture. I have found the Amish in our community to be great neighbors. Trips to Canistota to the Ortman Clinic are pretty routine, and You would meet Amish, Hutterites, Mennonites among others. Oh, and yes the treatments are worth it.